Why Do People (Re)-Elect Bad Leaders? ‘Why do people (re)-elect bad leaders?’ used to be a question that people only asked of third-world countries. No more. The recent election of unfit people to prominent positions in the U.S. and elsewhere has finally woken some American political scientists from their mildly racist reverie—the dream that they are somehow different. So why do people (re)-elect bad leaders? One explanation that is often given is that people prefer leaders that share their ethnicity. The conventional explanation for preferring co-ethnics is that people expect co-ethnics (everyone) to do better under a co-ethnic leader. But often enough, the expectation seems more like wishful thinking than anything else. After all, the unsuitability of some leaders is pretty clear. If it is wishful thinking, then how do we expose it? More importantly, how do we fix it? Let’s for the moment assume that people care about everyone. And if they were to learn that the co-ethnic leader is much worse than someone else, they may switch votes. But what if people care about the welfare of co-ethnics more than others? The ‘good’ thing about bad leaders is that they are generally bad for everyone. So, if they knew better, they would still switch their vote. You can verify these points using a behavioral trust game where people observe allocators of different ethnicities and different competence, and also observe welfare of both co-ethnics and others. You can also use the game to study some of the deepest concerns about ‘negative party ID’—that people will harm themselves to spite others. Disagreement over policy conditional on aims should not mean that you think that people you disagree with are not well motivated. But regrettably, it often does. Lack of real differences doesn’t mean a lack of perceived differences. See here, here, here, and here. Assume partisan identity is slow moving as Green, Palmquist, and Schickler (2002) among others show. And then add to it the fact people still like their ‘own’ party a fair bit—thermometer ratings are a toasty 80 and haven’t budged. See the original paper. People like ideologically extreme elites of the party they identify with a fair bit (see here). the history of racial bigotry is a good example. The title of the paper is off in two ways. First, partisan affect can be caused by ideology. Not much of partisan affect may be founded in ideological differences, but at least some of it is. (I always thought so.) Secondly, the paper does not offer a social identity perspective on polarization. The effect that campaigns have on increasing partisan animus is still to be studied carefully. Certainly, ads play but a small role in it. Evidence on the key take-home point—that partisans dislike each other a fair bit—continues to mount. The great thing is that people have measured partisan affect in many different ways, including using IAT and trust games. Evidence that IAT is pretty unreliable is reasonably strong, but trust games seem reasonable. Also see my 2011 note on measuring partisan affect coldly. Interpreting over-time changes is hard. That was always clear to us. But see Figure 1 here that controls for a bunch of socio-demographic variables, and note that the paper also has over-time cross-country to clarify inferences further. If you assume that people learn about partisans from elites, reasoning what kinds of people would support this ideological extremist or another, it is easy to understand why people may like the opposing party less over time (though trends among independents should be parallel). The more curious thing is that people still like the party they identify with and approve of ideologically extreme elites of their party (see here). 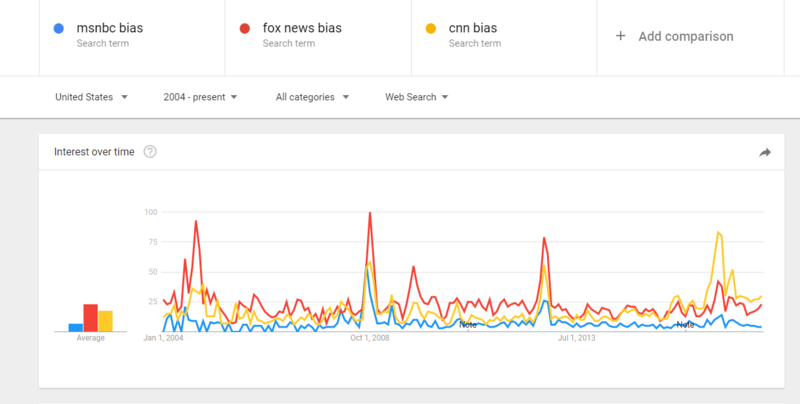 All politics may be local, but Google search data suggests that people are far more interested in learning about the president than they are in learning about their local politicians.